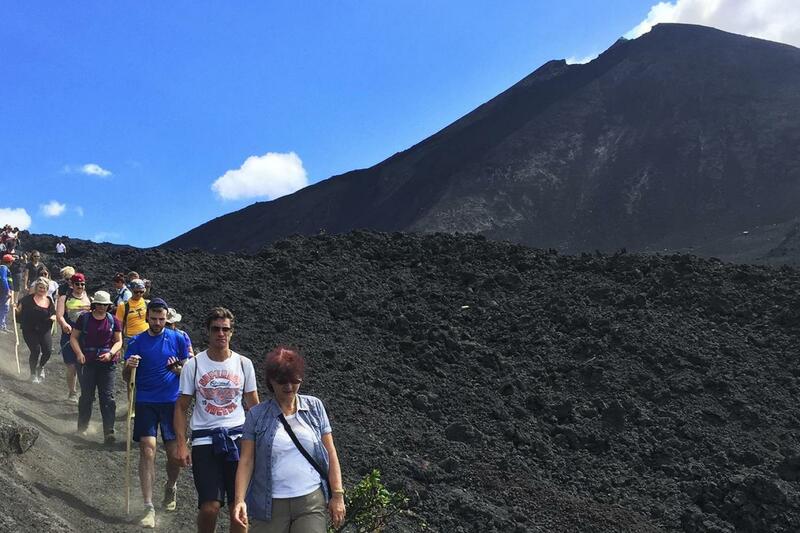 On this unique and adventurous tour you will visit Pacaya National Park to explore the most active volcano in Guatemala that sits 2500 m. above the sea in an environment formed by humid forest and rocks. Transfer to the foot of the volcano Pacaya and from there, we start hiking from the San Vicente de Pacaya village and begin ascent; the route is estimated at 60 minutes of walking up to a distance of approximately 50m from the crater at the top. You can see down into the crater to the lava as well as experience the energy of an active volcano. Pacaya Volcano remains one of the active volcanoes of Guatemala. After the visit and exploration of the Pacaya Volcano we will continue to Kawilal Hot Springs to take time for lunch ( Included ). Kawilal is a world of relaxation, where the most important elements of nature are present in this unique hot springs pool. The thermal pools are warm from the fire and heat of the Pacaya Volcano. This relaxing complex promotes sustainable tourism in our country and has 12 thermal pools, Thermal Circuit, 25 steam baths, and 3 hydrotherapy baths. The spa offers Relaxing Massages, Reflexology, Shiatsu Relaxing, Manicure and Pedicure among others, within our facilities are also Fonda Del Castillo, a restaurant with international with fast food service. At the end of the tour Transfer to Antigua Guatemala.